Think Catalonya is done, and it just keeps on surprising you. I thought I would have breakfast, ride downhill to Barcelona and catch a ferry to Genoa, Italy. Half the town was at breakfast, but it wasn’t for me, only a tableful. The rest were there because on Sunday mornings that’s where they gather. Marti was slinging omelettes and coffee and heavy fare. Although it is almost nine, they are on two hours of daylight savings time here, so the sun is low and the air is chilly. There are old couples, and families, of course, but also tables full of done-up bcycle racer types, all ages, loading up; and tables of off-road motorcycle guys, in boots and leathers and helmets, old and young, fathers and sons, laughing and shouting, lots of them; farmers with sons in clean work clothes, eating from giant plates of food. One out of four men were having beer with their breakfasts. The sound was of a party at full swing. My table was stuffing me with carbs and protein, urging me to eat more and take some with me. Jordi and I got a ten o’clock start, and talked for ten miles. Then I was on my own to ride and reflect. They know how to live here in Catalonya. Without a guide like Jordi I might have ridden through Girondella and thought it was a quiet, boring little nowhere town past it’s prime. And in some ways it was, with the closed mills and struggling farms. But it is also full of vital, happy people living busy lives and enjoying it to the fullest. Sometimes I follow a Google map for walking, no matter how ridiculous it seems with freeway shoulders, nice bikeways, city streets and goat-ath roads. It’s often interesting territory I wouldn’t see otherwise. I followed one such route after lunch that went through town after town, then through a big national forest. 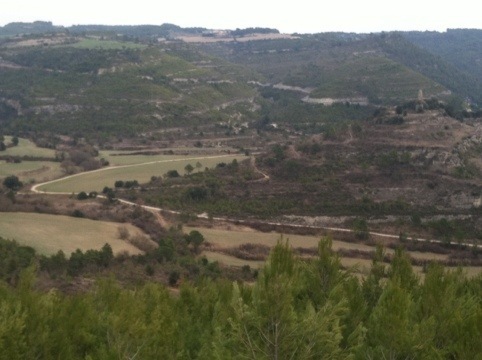 It was longer than the highway, but I could camp and reach Barcelona next day. That developed into two days of riding and camping in a strangely perfect land. The road was smooth dirt in places but rocky, steep, and loose in others; most four-wheel-drive vehicles would have made it. For me it was almost all low-gear grunting and very fast or very slow descending. In two days I saw two vehicles (moving, that is). There were people living here, miles from the pavement, at three to five mile intervals, in very old stone farmsteads, most with extensive waterworks, cisterns, animal troughs and garden irrigation. Leeks and brassica, fruits and nuts, goats and poultry. Some of the water was cached rain, some from wells. Most homesteads had power, all had woodpiles and antennas. The road at each one ran through the center of the dooryard, inches from the house, inches from open barn doors, and was paved with stones. It was their driveway, with kids’ toys and dog bowls to dodge and gates to negotiate. I was shocked to see the first one. I came on it from the back, and when I rounded the corner I was in their dooryard, huge paving stones and small parked vehicles, chairs and benches, looking like an oversized patio. The road continued on the far side, but I was face to face with the owner, and we were both amazed at what we saw. “You speak English!” I said. He was 25 or 30, a musician in a Catalyun band, (named Sherpah, like my bike, Sherpa, hmm, http://www.sherpah.cat, the drummer), had a wife and two kids, was doing some bio ag on an old farm, and he had to go in ten minutes. As he loaded his diesel VW van he made sure I was seated, had beer, water, food, etc., and we talked about music, kids, farming, heritage and tradition, all in ten or fifteen minutes. He told me if I continued, I wouldn’t see pavement for three days, and shook my hand with gusto when I indicated my intentions. A fresh beer, goodbye to all, and I was left at their table, my toes on the google maps blue route line. They begged me to stay until they returned, but I lunched and left. One good guy I’ll never forget. Over the next couple of days I saw four or five more establishments like this, some bigger, some better, all of them vigorously inhabited. I didn’t meet any more inhabitants, but I filled my bottles at their spigots, admired their gardens, and left the gates as I found them. I would have been happy if it went on like this for weeks. But after a couple of days the road got bigger and soon I had pavement, downhill all the way to Barcelona through towns and city, to the center and then the center of the center and there’s Christopher Columbus, at the harbor, sword pointed seaward, surrounded by historic churches and modern art. 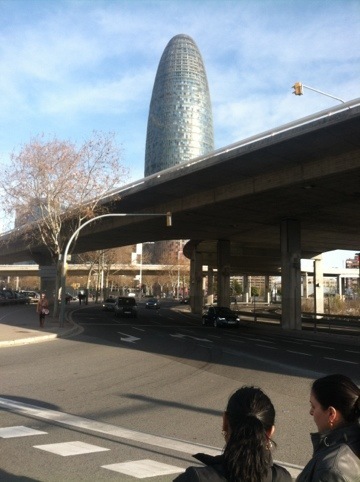 Barcelona has a great, vibrant internationally hip feel, sporty and friendly. I rode around, found some neighborhoods, had some food, met good people who watched my bike while I cleaned up. To top off my visit on Catalonya, I had a Catalonyan cream, a sweet creamy custard in a round earthenware bowl, burnt to a crisp on top, hard to crack through with a spoon, a taste of burnt marshmallow with sweet custard. At the Port I faced a decision: Genoa, Legarno (Florence), or Civitavecchia (Rome). Many factors involved: logistical, philosophical, economic, meteorological, general. Long story short, Rome. It was cheaper, included a bunk, and brought me to center, not northern Italy, with a better forecast, AND it left soon, taking care of the night’s lodging. The the ferry was half full, crossing was rough. I was fine, but many suffered, including my cabin mate, a businessman with a truckload of goods. Picture me alone on the forbidden deck, one hand on my Fedora, the other gripping the rail, shouting, “YEE-hah!” into the wind and spray. Now picture me eating, blogging, and lounging in my cabin, lulled to sleep by the waves and creaking and wind noise, like sleeping in my camper on the way home to Vermont from Jane Street while someone else drives. Next stop, Italy. But I won’t soon be forgetting Catalyuna. i love the image of you grasping your hat and shouting at the wind and waves. watch out italy! Do you have a picture of that gate right in the road and that family’s courtyard? Sounds so fascinating Billy…enjoy! Hi Bill, how is your tour doing in Bologna? I enjoyed traveling with you the last days. Especially the time that Christopher joined us and we slept in the barn, you playing the mandolin and harmonica at the same time. Will remember the after dinner chats we had.